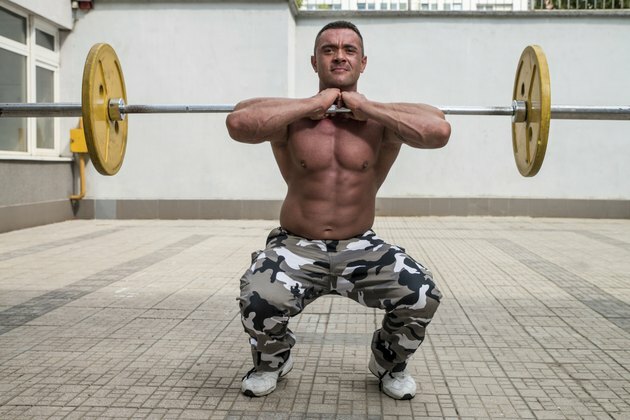 Are Hack Squats Bad for the Knees? The hack squat is performed on a machine that virtually locks your body into place at an angle. Properly performing the hack squat presents no health risk to your knees. However, if you have a history of knee problems the hack squat -- along with any other type of squatting exercise -- could further exacerbate the problem. Speak with your doctor first to ensure you are fit enough to do the hack squat. The hack squat machine allows you to perform a weighted squat without the need to balance yourself as you would during a traditional free weight squat. If the hack squat is performed incorrectly, then the exercise can adversely impact your knees. The key is to follow protocol on properly executing a hack squat, which is primarily dependent on how your feet are positioned on the hack squat platform. If you have a history of knee problems -- and after speaking with your doctor -- perform the hack squat first without any weight and evaluate how your knees feel after several repetitions. The positioning of your feet is key in executing the hack squat properly. Good form makes the exercise safe and won't harm your knees. Always point your toes slightly outward when planting your feet on the platform. Doing so encourages your quadriceps muscles to become engaged more and takes pressure off the medial collateral ligament in the knees. Do not point your toes straight ahead, or you risk overloading knee cartilage. The hack squat can be performed using various stance widths. If any particular stance causes discomfort when performing the exercise, adjust the width of your stance. Keep your back and head against the padding at all times. Tuck your shoulders underneath the shoulder pads and grasp the handles, which are usually near the shoulder pads or at your sides near the hips. Properly position your feet on the platform. Your legs should be at a slight forward angle from your upper body. This keeps the knees from jutting out past the feet, which is important in minimizing the pressure on your knees. Once you've found your starting position, lift up to disengage the safety bar and move the safety handles to free the sliding mechanism. Keep your legs straight but don't lock the knees. Begin by slowly lowering as you inhale. Lower until your thighs and lower legs form slightly less than a 90-degree angle. Ensure your knees are above your feet and not past them. Contract your quadriceps and hamstrings and push through your heels to power yourself back to the starting position as you exhale. Do not lock your knees as you fully extend your legs. Repeat for the desired amount of repetitions. Some basic weightlifting gear can help you execute the hack squat comfortably and safely. Good shoes with rubber tread help your feet grip the platform and reduce the risk of slipping. The shoes you use for hack squats should provide you with good arch support, which further reduce the amount of stress put on the knees. Use knee wraps or braces if you have had knee problems in the past or plan on lifting very heavy weights. The wraps help relieve some of the pressure from squatting. Why Are My Knees Swollen & Bruised After Running?